We found awesome in a furnishing shop on Waterfield Road and here’s why you should give it a spin. Satnam Furnishing Fabs is a standalone store that shines bright among the various apparel stores on Waterfield Road. With its branding on the simpler side, it’s a humble establishment on this otherwise fancy road. We loved their floral cushions, each design was distinctly beautiful, almost giving it a water-coloured look. Priced at INR 350 each, it gave stiff competition to the overly-priced designer brands that sell you ”Italian design” for thousands. 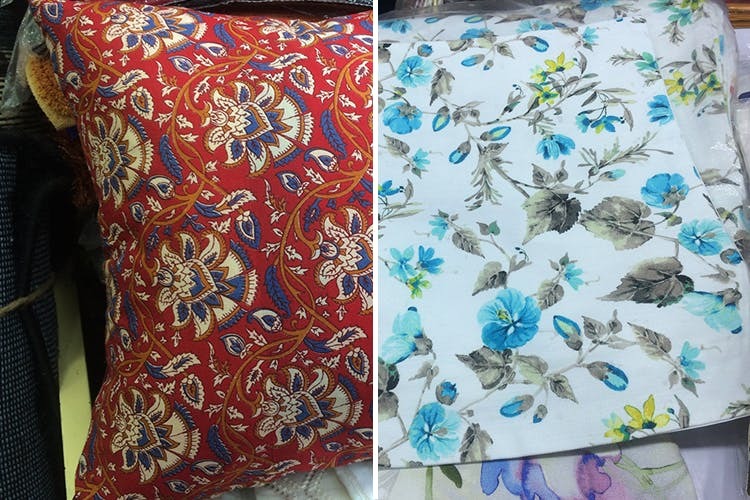 The fabric was good and the designs would add a soft look to any living/bedroom. If your home’s look is more towards Fab India, they also have ethnic-prints at INR 150 a piece. Do check out their curtain fabrics as well, although they are widely available at any furnishing store, the staff here will help you make an informed choice. Bed sheets start at INR 1,000. If you want to skip the hustle at fancy furnishing stores, head to Satnam. If you haggle with determination, you might just bring the prices down.